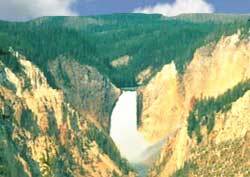 It is the first officially designated national park on our planet. And it boasts world-class natural features. Each is described in more deail on page two. This is the best all around time for a visit as the weather is pleasant and the tourist count is relatively light. These are the two busiest months. Be forewarned, traffic jams are common on both the roads and the pedestrian sightseeing boardwalks. The least desirable season is winter. It can be quite cold and many roads are snow blocked.